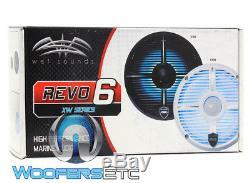 REVO6 - Wet Sounds 6.5 100W RMS Marine Coaxial Speakers. 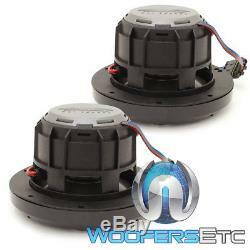 2-way 6-1/2 marine speakers (pair). 8 grille styles to choose from. Composite cone woofer with Santoprene rubber surround. 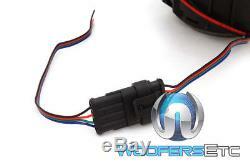 Durable rubber spider and magnet boot. 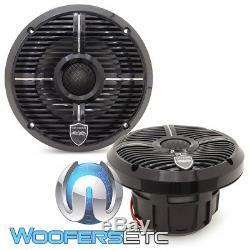 Handles up to 100 watts RMS (200 watts peak). Frequency response: 40-20,000 Hz. You will be issued a Return Authorization Number. In order to maintain an inventory of 100%, Brand New, A-Stock, untouched products, all sales are final. We ask that you please be sure you are ordering the correct product. 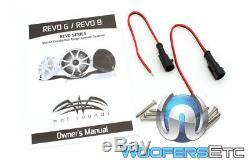 The item "WET SOUNDS REVO6 XWB 6.5 BOAT 2WAY TITAINUM TWEETERS MARINE SPEAKERS LED LIGHTS" is in sale since Tuesday, October 28, 2014.